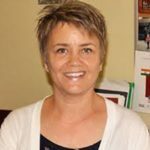 Betsy Parrish is a professor in the TEFL (Teaching English as a Foreign Language) and Adult ESL Certificate programs as well as in the MA in ESL in the School of Education. She has worked as an ESL/EFL teacher, teacher educator, writer and consultant for over 30 years. Professor Parrish authored Teaching Adult ESL (McGraw Hill 2004) and Four Point: Advanced Listening and Speaking (University of Michigan Press 2014). She is a frequent presenter at state, national and international conferences on adult education issues, including academic and career readiness, workplace ESL, cross-cultural communication, and learner-centered teaching practices. She is Senior Consultant for ABE Teaching and Learning Advancement System (ATLAS), which provides professional development for adult basic education teachers throughout Minnesota.